Redlands Coast is one step closer to having an Age-Friendly City Strategy following the completion of a survey of seniors that sought to understand their experience of ageing in the Redlands. 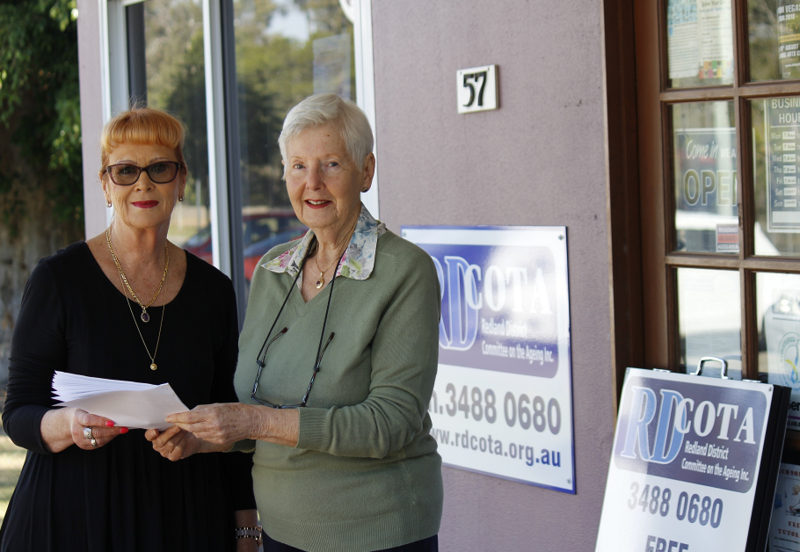 Long-term Redlands resident Karen Griffith hands her completed survey to RDCOTA’s Fay Dougall. Redland City Mayor Karen Williams said it was timely that the survey – executed by Redland District Committee on the Ageing (RDCOTA) on behalf of Council – was wrapped up just before Seniors Week celebrations in the Redlands. “Along with the rest of south-east Queensland, Redlands Coast has an ageing population and the area continues to attract an increasing number of seniors looking towards a more relaxed lifestyle in their retirement years,” Cr Williams said. “It is important that people of all ages are valued, respected and can actively participate in the community – and our seniors are no exception. “Long acknowledged for their enormous contribution as volunteers, seniors are also great economic and social assets to our community and we are keen to harness their experiences, skills, needs and wisdom. “I thank RDCOTA for administering our survey of 100 seniors as well as the groups and networks they worked with to identify suitable participants. Long term Victoria Point resident Karen Griffith said she was happy to complete the survey. “As a resident of 35 years, I think it’s important to find out people’s feelings and concerns and see us move forward together as a community,” Ms Griffith said. Cr Williams said the surveys would help shape Council’s Age-Friendly City Strategy, which was expected to be completed in 2019, and based on principles from the global age-friendly cities program developed by the World Health Organisation.